When I ran WinDirStat program on my Windows 7 64 bit and Windows XP SP3 computers, I found a file called $PatchCache$ under the following directory to occupy large amount of space 2 to 3 GB (depending on the computer). In one my machines, the C:\ drive (actually a partition on a larger drive) where Windows directory was located had only 10 GB total allocation (since it was a Windows XP SP3 machine and 8 years old), I needed to recover some space in the c:\ partition. This was made more important since I had less than 10% free space, making even defragmenting using “Defraggler” not optimal. So I Googled the search-term “can i remove $PatchCache$”. The two following links came up as promising ones. So I followed the instructions in the posts and I am repeating them here. and hit return. After few seconds you will get the empty prompt again. This means the $PatchCache$ directory has been cleaned. Subsequently, the space occupied by that directory should be free and you have now reclaimed some wanted space. Typically when one tries to install Microsoft Windows compatible programs and follow the ‘Default’ or ‘Recommended’ settings, the programs are installed in the “c:\” drive. For native Microsoft Windows programs like Internet Explorer, Microsoft Office, etc. this may be the ‘best’ option to avoid problems later on. However, if you have older machines that came with smaller “c:\’ drive or if you are like me who partitioned the original hard disk to “c:\” for o/s-related programs, “d:\” for non-Microsoft programs, and “e:\” for user files, time may come to install files in locations other than “c:\” as “c:\” gets filled with Windows Updates and other Microsoft o/s data. This may not be a problem if you have a larger disk or your program-installer allows you to select where the program will get installed. For example, many installers will give you an option to follow ‘Default’ or ‘Advanced’ modes. The ‘Default’ mode will install the program in “c:\” drive while the ‘Advanced’ option will install it in “d:\” or other drives. However, I have encountered a problem with Google Chrome that wouldn’t give me an option (at least I couldn’t figure out) of selecting destination drive and got installed by default in “c:\” drive. The problem was severe in my older machines where I wanted the faster Chrome but it ended up taking up larger portion of “c:\” drive. The latter prevented me from properly defragging or cleaning the drive. Junction will add a pointer in a location to a location where your program actually resides. So in our example we will simply add a pointer in “c:\” to location in “d:\” where the program will be located. Since pointers don’t occupy lots of space you can still live with a small “c:\” drive for little longer. Go to http://technet.microsoft.com/en-us/sysinternals/bb896768 and download Junction (currently v1.06). Then unzip the download to temporary location (alternatively one unzip directly to “c:\windows\System32”). If you have unzipped in a temporary location copy the file ‘junction.exe’ to “c:\windows\System32”. Now, go to Start button> All Programs >Accessories>Run Command Prompt (alternatively you can select Windows Key + “R” to get the Run dialog and in the Run dialog issue ‘cmd’ and get the Black Command Line terminal) (c:\windows\system32\cmd.exe). With the junction installed now download your program (in my case Google Chrome) and run the installer. You will now notice that the program got installed in “e:\” rather than “c:\”. I actually uninstalled Google Chrome from “c:\” to free-up space. Then ran the Junction program. Then I reinstalled Google Chrome (now in different location automatically). Then we took a 500 GB external (USB) hard disk and formatted it in Mac format (HFS). Attached the USB disk to the Mac Book and ran the Time Machine program on the Mac Book and saved the disk carefully. Then we took another 500 GB external (USB) hard disk and formatted it in Mac format (HFS). Then attached the second USB disk to the Mac Book and ran the carbon copy cloner (CCC). While running CCC we selected the Mac Book as the ‘Source’ and the external hard disk as the ‘Destination’. We needed to make a ‘Recovery Partition’ on the MacClone before copying all the contents. When completed we ejected the disk and kept it aside. So we now have Time Machine hard disk and Carbon Copy Cloned hard disk. With somewhat identical but different type of back-ups of the original disk. Then we shut down the Mac Book. 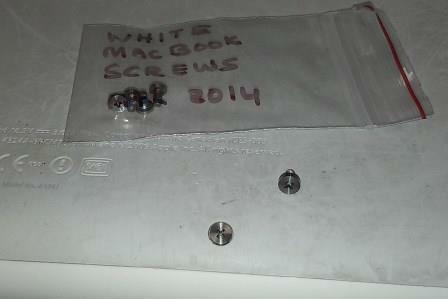 Then we opened the back cover of Mac Book by removing the 8 Phillips screws. Then we proceeded with removing the original 250 GB Hitachi hard disk and replacing it with 320 GB Seagate hard disk (both have SATA interface). The Mac Book manual shows how to do this. The original hard disk with all contents of Mac Book was labeled and stored safely. The back cover of the Mac Book with larger hard disk was closed. Now we a third copy of the original content in the form of the original hard disk. With the new hard disk inside, connect the Carbon Copy Cloned hard disk via USB port and start the Mac Book while holding the ‘alt’ or ‘Option’ key. With this special booting mode, the window you show you two options: ‘MacClone’ or ‘Recovery HD’. Here, select the MacClone and boot the Mac Book using it. Then using the Disk Utilities in the MacClone disk, partition the Mac Book’s new hard disk into one large Mac formatted disk (HSF). Now use the CCC in MacClone disk and copy back your MacClone to the new (labeled MacBookNew). The source this time will be ‘MacClone’ and destination will be ‘MacBookNew’. Once again it will ask for ‘Recovery Partition’ and ‘Regular area’ accept both and copy it. Still using the ‘MacClone’s Disk Utilities now shrink the one big partition to 210GB (leaving 110 GB) as an empty area. Now using the MacClone’s gptdisk utility make hybrid MBR. Now shutdown the Mac Book. Before you restart the Mac Book, slide Windows 7 64-bit installation DVD into the Super Drive. Then boot the Mac Book with ‘Alt’ aka ‘Option’ button held down. You will now see four options to choose from ‘Mac HD’, ‘Recovery Partition’, ‘Windows’, and ‘EFI’. Using the arrow keys or mouse pad select ‘Windows’ and hit ‘Enter’. You will now go through the regular Windows 7 64-bit installation. It may ask you to reformat the 110 GB partition to be in NTFS mode, go ahead and do it. Continue the Windows installation. Take the DVD out and shut down. Restart while holding the ‘alt’ button and select Windows and get all updates and install all necessary software (you may have to go over several reboots to get all updates). It is very likely you will not have the necessary Windows drivers for Wi-Fi, Ethernet, Video for the (nVidia MPC86 chipset). So while running under Windows mode, slip in the Mac installation disk and run boot camp. This will install all the Windows drivers.